Alan Dickens says Ahsee Tuala and Tom Stephenson will be fit to face Sale Sharks on Saturday. Tuala was forced off in the recent win against Clermont Auvergne and missed last weekend’s defeat at Saracens as Saints opted to rest him. But he will be available to face Sale, as will Stephenson, who came off at half-time against Saracens. But Dickens said: “Ace was fine. “We’re very cautious with head injuries, which is quite right. “He’s come through the process, no problem. Alex Waller continues his recovery from the broken arm he sustained against Newcastle Falcons in early December. The prop was initially ruled out for eight to 10 weeks and remains on track to return within that timescale. “We’ve trained this morning and he’s charging up and down the touchline,” Dickens said. Luther Burrell suffered a calf injury in the win against Gloucester on January 6. And Dickens said: “Luther’s not doing the same kind of intensity as Alex Waller is. As for Piers Francis, who suffered concussion in the defeat to Harlequins on December 30, Dickens said: “He’s trained near enough full on this week. 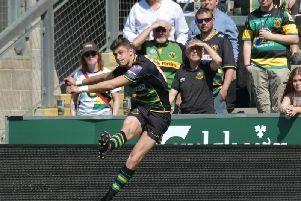 If Saints can win at Sale on Saturday, they could qualify for the Anglo-Welsh Cup semi-finals should other results go their way. And when asked about his selection plans, Dickens said: “We want people to have game time but we also want to be competitive. “The block we’ve just had is pretty physical and we’ll use it (the Anglo-Welsh Cup) to rest people.